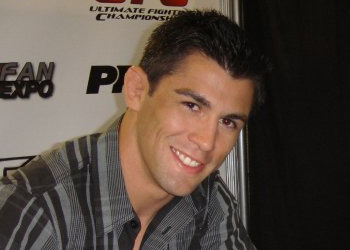 After handing the talented Joseph Benavidez his second professional loss at WEC 50 on Wednesday night, it’s clear bantamweight king Dominick Cruz is efficiently making his way down the world’s best pound-for-pound path. Unlike their first tango one year ago where Cruz used his superior wrestling to cruise to a unanimous decision win, he kept Benavidez off balance with his fancy footwork for most of their mulligan and was able to secure a few rounds with some late takedowns. Courtesy of “Doc” Hamilton, Cruz will be forced to settle for a split decision victory. It was his 16th career win in 17 outings. Clearly, when you don the hardware and your resume is nearly immaculate, chatter regarding world’s best P4P will eventually/ultimately include you. While some may argue it’s a tad premature to mention him the same breath as (I’ll let you fill in the blank), the soon-to-be 25-year-old thinks he’s already in the conversation. “I rank among the best in the world. There’s not a doubt in my mind,” Cruz matter-of-factly stated. FYI, former WEC featherweight champ Urijah Faber is responsible for the only L on Cruz’s record. “The California Kid” submitted him at WEC 26 back in March 2007 in a 145-pound affair.